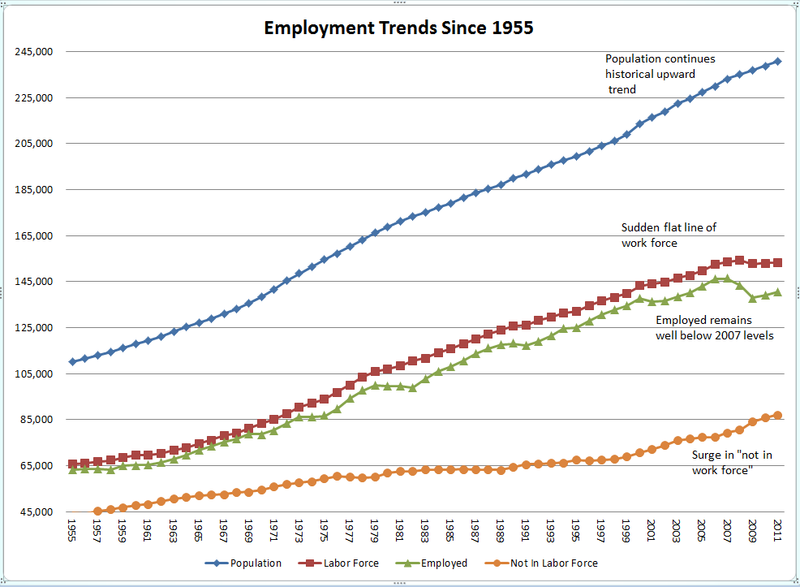 On today's labor report: Note how the labor force has flat lined for four years even though population growth has averaged 1.5 million for the past 55 years. From 1993 to 2007 population growth was 1.7 million per year! Thus, the labor force should not suddenly turn flat since retirements do not even come close to explaining the chart. 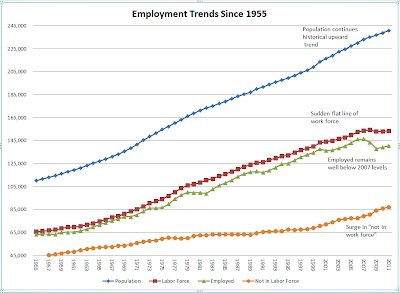 Yet, suddenly the work force has just been frozen in time although the population continues on the same upward trend. The work force is literally one million smaller than during Bush's last year in office. This is statistically impossible, at least judging from historic trends. We also are still 5.6 million people below the employment number of the peak year in 2007. So, practically speaking we have approximately 11.6 million more people unemployed than in 2007. If we add the additional 6 million that should be counted as available for the labor force, the unemployment number at the U-3 level surges past 11% as you have said numerous times.